Harry Billinge landed on Gold Beach at ‘H Hour’, 6.30am on 6 June 1944. He was just 18 and part of the first wave of troops. Harry was a Sapper with the Royal Engineers. Now 93 years old, Harry has dedicated his life to remembering his friends who never made it back home. This is Harry Billinge’s D-Day Story. Harry was speaking to us on Gold Beach, where he landed almost 75 years ago as a young man. The British Normandy Memorial will overlook Gold Beach. Harry has committed himself to fundraising for the monument which will commemorate the sacrifices made by his friends, honouring the bond of comradeship forged on the sands of Normandy so long ago. 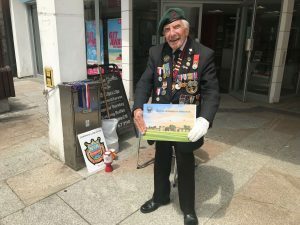 He lives in Cornwall and is often seen on the High Street in St Austell, proudly wearing his medals and green beret, collecting money from passers by and telling youngsters about what happened during the war to ensure his friends’ sacrifice is never forgotten. Harry has raised thousands of pounds. 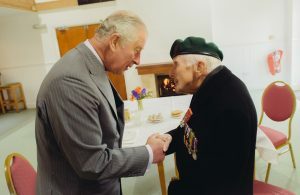 Our Royal Patron, The Prince of Wales visited Harry recently to thank him for his efforts.